An example of outerwear at, possibly, its most ornate, this short mantle was designed more for the sake of appearance than for warmth. 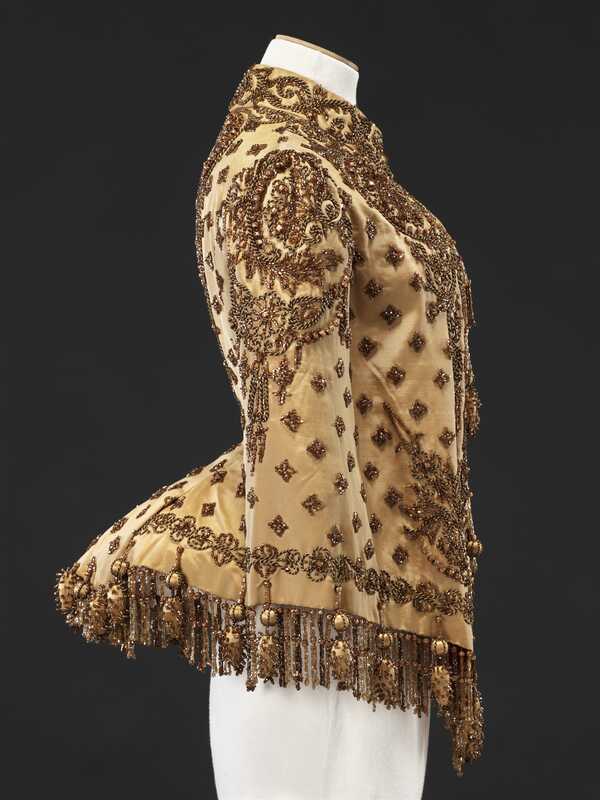 Short and loose at the front, it is fitted over the shoulders and into the small of the back with a pleated section to fit over the bustle. 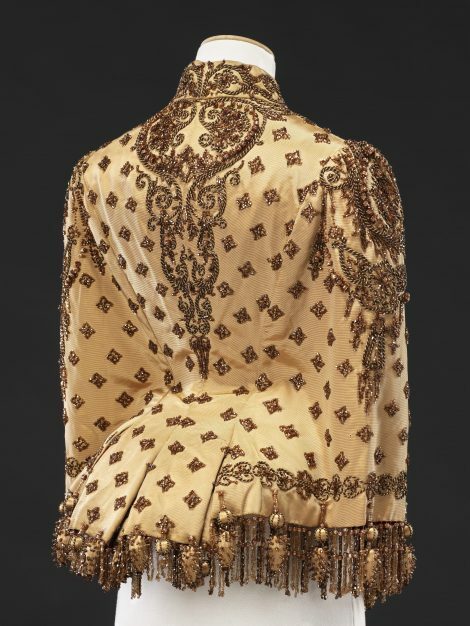 The light brown grosgrain silk is richly ornamented with couched cord and beading in small all over motifs and denser borders and areas of symmetrical curvilinear designs on the collar, upper arms, both sides of the front and the centre back. 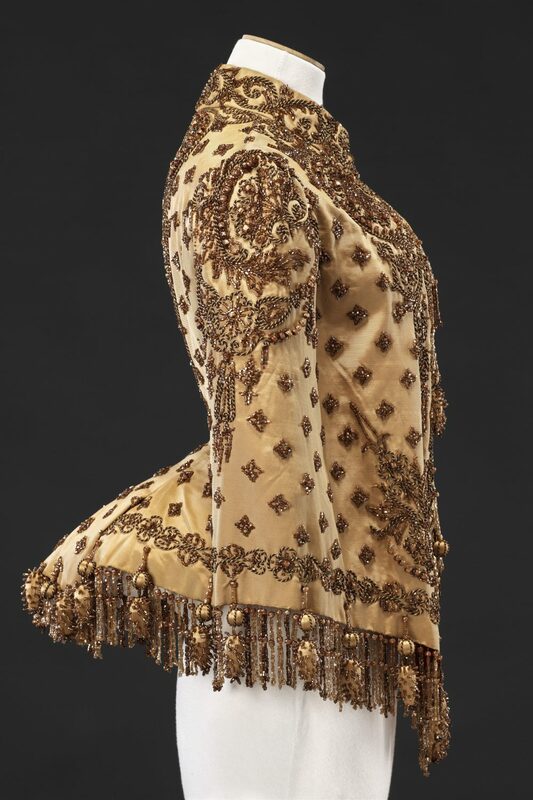 Similar designs of surface decoration were prevalent on both dresses and outerwear in the late 1880s as the focus of attention began to move away from the ornately draped and swagged skirts of the preceding years. 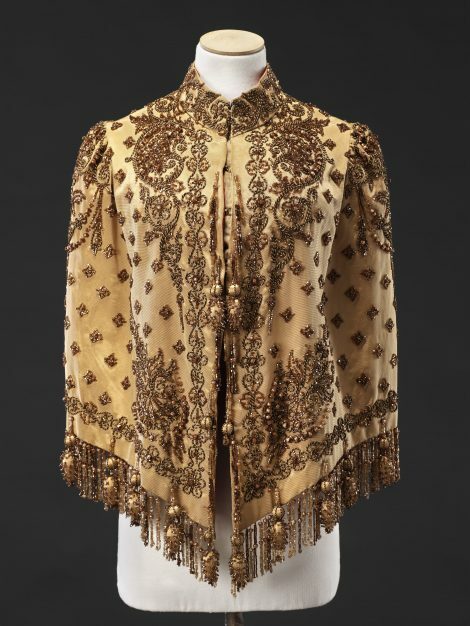 The hem is bordered with a deep bead fringe and silk-covered wooden pendants each comprising a small ball trimmed with cord over a bead-studded tear drop. Unsurprisingly, this quantity of trimming makes the mantle very heavy. It is lined in scarlet silk twill with a panel each side of the front opening, through which the arms could be inserted, a matching ribbon waist tie, and a loop at the back of the neckline so that it could be hung up. In the 1880s, 52 Bold Street, Liverpool was the address of a music hall with shops beneath, one of which was S.S.Bacon where this mantle was bought. Originally laid out in the 1770s and named after a local merchant Jonas Bold, Bold Street was known until well into the 20th Century for its elegant and high class shops, showrooms, banks and restaurants. The historical archive, The Bold Street Project, mentions ’52, former music hall [and] exclusive ladies’ outfitters (T.S.Bacon and Jaeger)’. T.S.Bacon was probably a later member of the family to run the business.